There are 39 rooms in Koidulapark Hotel. 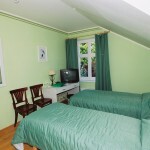 Our rooms are suitable for allergics and we have one room suitable for disabled. 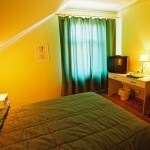 Some of the rooms can fit extra beds, pets are allowed for an extra fee. The hotel has a free parking lot for the customers. We hafe a free lock box in the hotel, free wireless internet is available in the lobby area. Bathroom and international TV programs are in each room. Prices include breakfast and VAT. The only single room of the hotel is special – besides wonderful view of the park it`s unique due to its original wooden board floor dating from 1905. Guests of the room feel themselves enjoying historical atmosphere and romantic park greenery. Each room has its own face, but all allow silent sleep. In the middle of traditional interior design of the beginning of 20th century and colours harmonising with the shades of the park in summer you feel yourself dignified and free. If you are with kids, the best choice is to take a family room, so that everybody could enjoy the vacation together. There is a park with a fountain next to the hotel and only 10 minutes` walk to the beach – awesome. With extra beds up to 6 people can stay. From the stylish and spacious suite on the first floor there is a marvellous view of the Lydia Koidula park. If you have decided to enjoy some quality time in Pärnu, then make sure that you take pleasure of your nights too – s suite with a special atmosphere is there to help. There are 39 rooms in the hotel and total 77 people can be accommodated. Viihtyisä ja rauhallinen hotelli. Hyvällä maulla ja ammattitaidolla entisöity. Henkilökunta rentoa ja ystävällistä. Suosittelen! Copyright 2014 © Koidulapark Hotel Pärnu - . All Rights Reserved.